Beginning at the top of the Hercule Gallery and descending on to the main courtyard is a spectacular double-revolution Carrera marble staircase dating from the 13th century and inspired by a similar staircase at the Chateau of Fontainebleau. 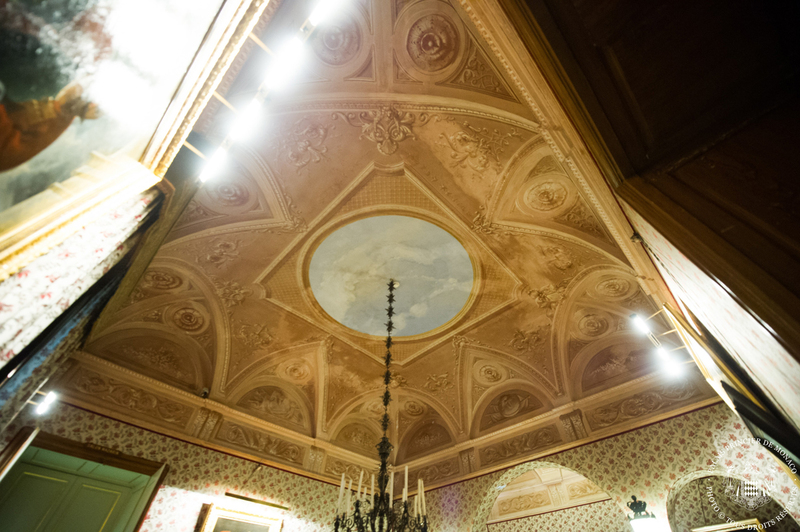 Adorning the gallery walls are frescoes of mythological figures attributed to Francesco Mazzuchelli dating from the 16th century and the Genovese artist Orazio Ferrari in the 17th century. The frescoes in the Palatine chapel in north end of the main courtyard depict the history of Saint Devote, the patron Saint of the Principality. 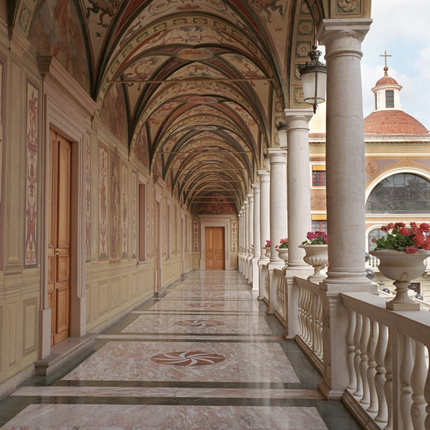 The chapel, built in 1665, is dedicated to Saint John the Baptist. 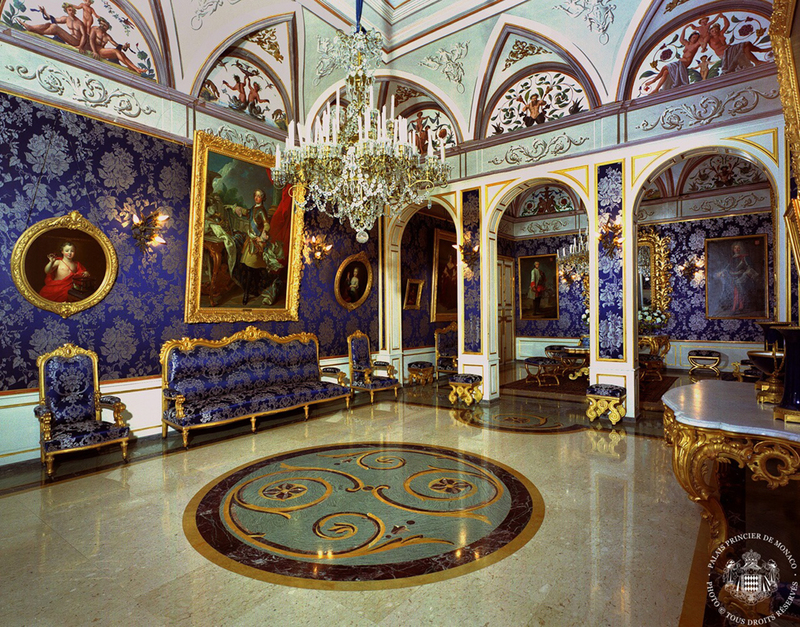 In order to enter the state apartments it is necessary to pass through the Mirror Gallery, which is used for visiting royalty and heads of state. The dramatic effect of the succeeding mirrors forms an image of a long succession of rooms, an imitation of Versailles. After the Mirror Room or Galerie des Glaces, one enters the Red Room furnished in the style of Louis XV with paintings by Flemish painter Jan Breughel and Mignard and Charles Le Brun. 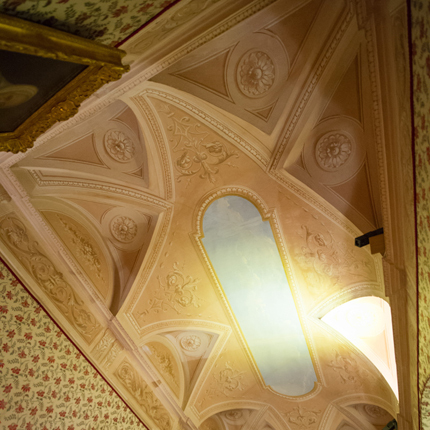 Following is the York Room, so named because the Duke of York, brother of King George III of England, who had been on a vessel near Monaco when he was taken ill, died there in 1787. 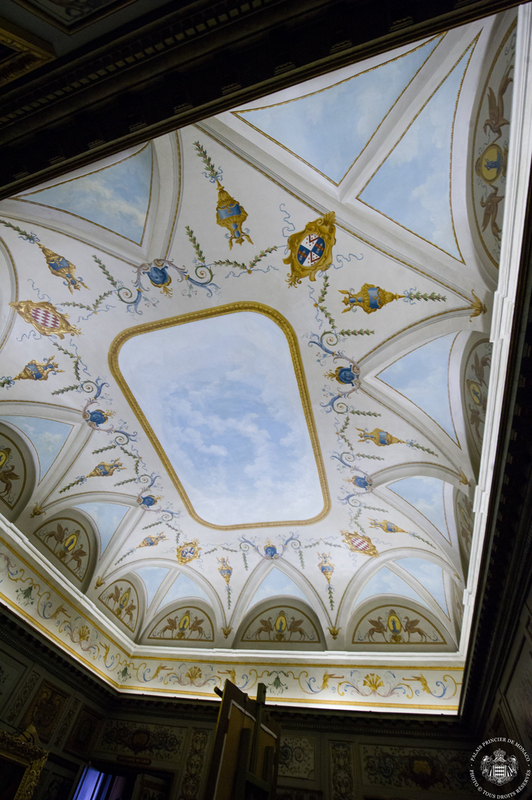 Despite the gloomy history, the room itself has beautiful frescoes, which decorate this room, represent the four seasons and are the work of the Genovese artist Gregorio de Ferrari representing the four seasons. 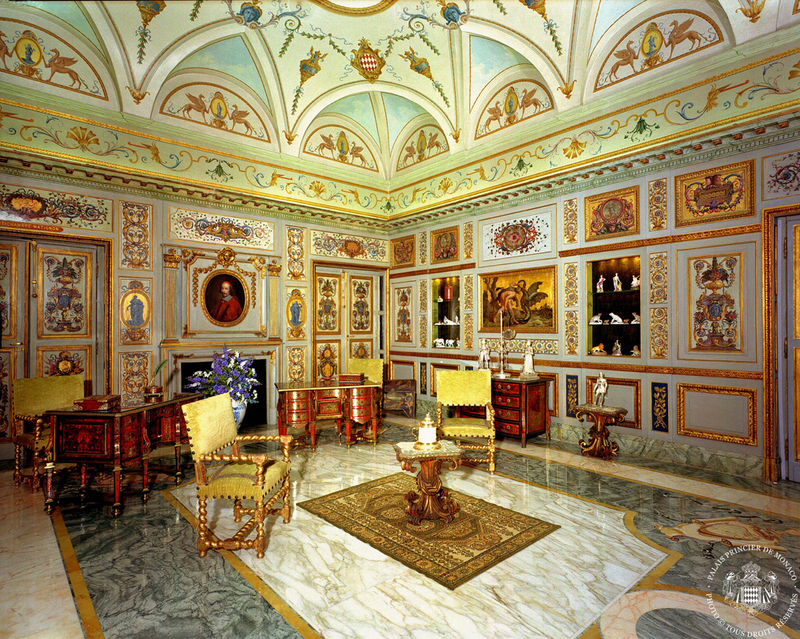 The marble mosaic table in the center of this room is the one designated to signing official documents. 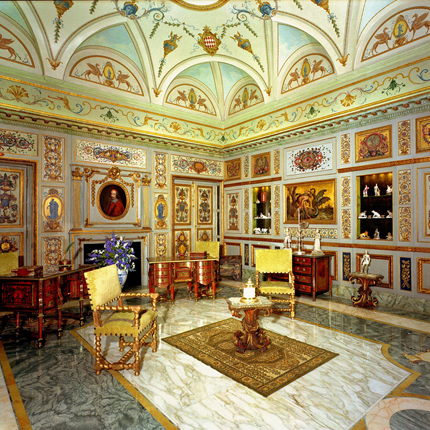 The room is furnished with ornate ebony Florentine furniture from the 17th century, a Boulle clock and royal portraits. The next State Apartment is the Louis XV bedroom called the Yellow Room, which is furnished period furniture and tapestries. 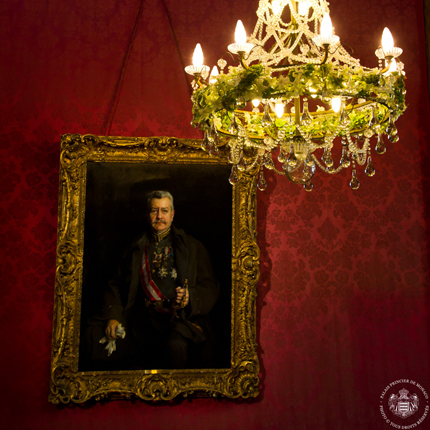 The room also contains a portrait of Princess Louise-Hippolyte by noted painter Jean Baptiste Van Loo. The following rooms are notable for their beauty and their distinctive use. The Officers Room is used by the Protocol Office to greet guests preceding official receptions. The room opens on to the Blue Room, which is used for official receptions. 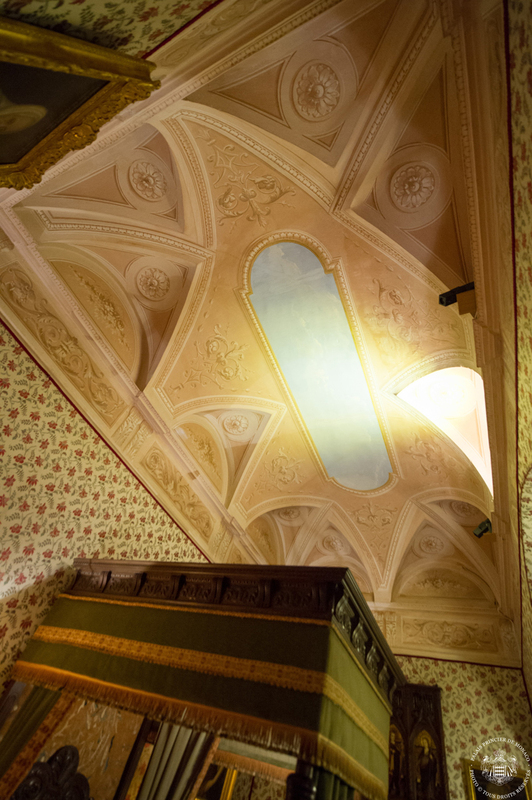 It received its name because the walls are lined with blue silk brocade. 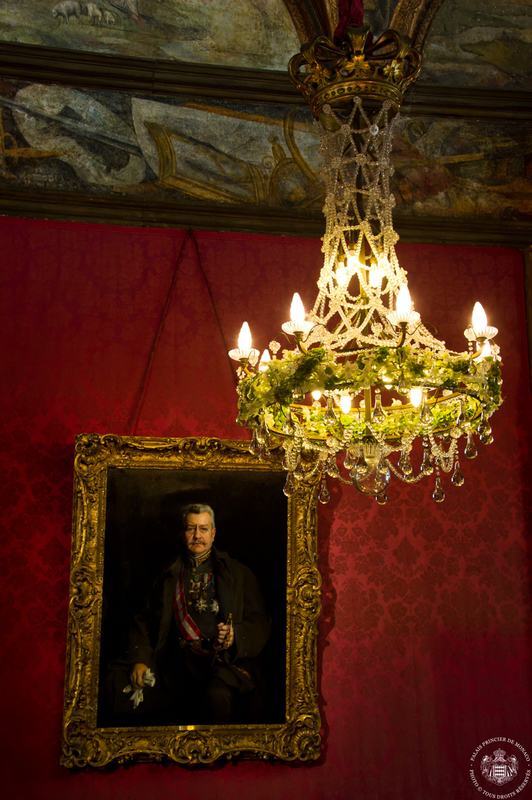 In it are Grimaldi portraits, 19th century Italian gilt and the dazzling Venetian chandeliers. 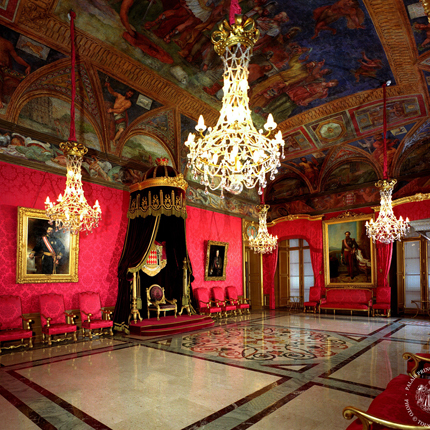 The magnificent Throne Room is where all official ceremonies, such as swearing-in-of-high ranking state officials and some state receptions take place. 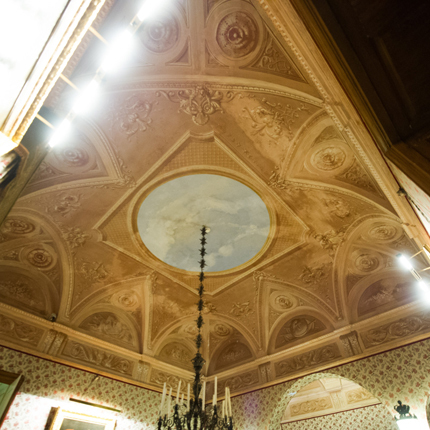 Its marvelous ceiling and wall frescoes were painted by Orazio Ferrari and represent the surrender of Alexander the Great, signs of the zodiac, a traditional motif for palatial Italian frescoes. The Empire-style royal throne rests under a red silk velvet canopy topped by the royal crown. Above the throne is the Grimaldi coat of arms and motto: Deo Juvante, With God's Help. 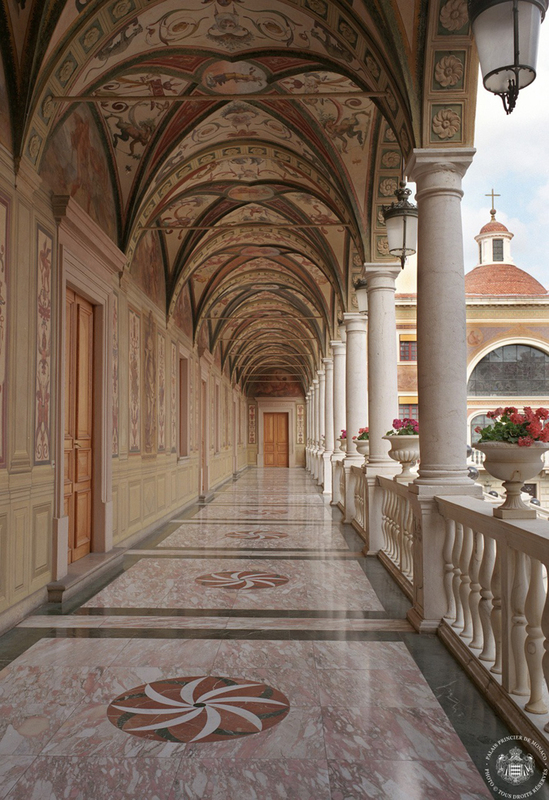 Its floors, like all the floors of the State Apartments, are inlaid with Carrera marble. In 1777, the Grimaldi family was united in marriage to Louise d'Aumont-Mazarin, the niece of the celebrated French statesman Cardinal Mazarin. 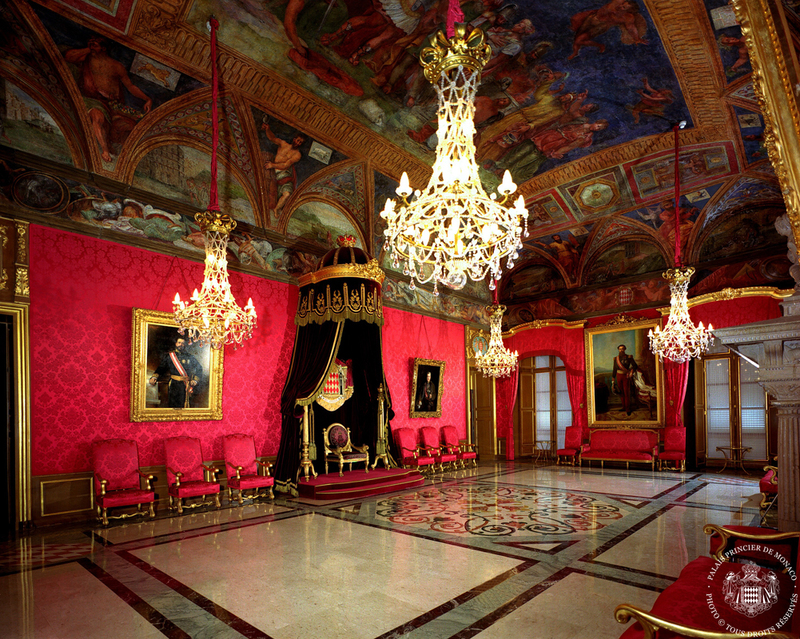 The Mazarin Room of the State Apartments is adorned with the best of ornate Italian woodwork done by Italian artists brought to France by the Cardinal and a painting of Cardinal Mazarin hangs over the fireplace. The following Louis XII bedroom is also associated with a famous churchman, Cardinal Roncalli, who later became Pope John XXIII and who stayed here when he visited Monaco. Next to this room is the Matigon anti-room testament to another aristocratic alliance by the marriage of Princess Louise-Hippolyte and Jacques, Francois Leonor de Goyon, Lord of Matignon in 1715. 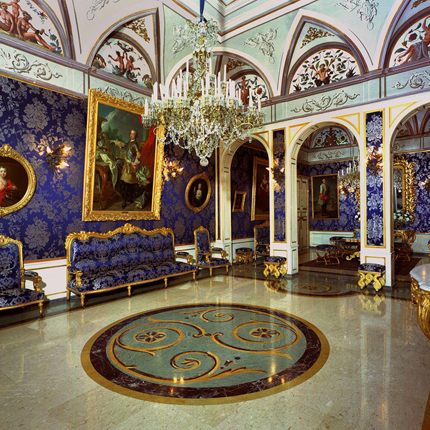 The final room of the State Apartments is the State Hall, which connects the Palace's southern and eastern wings and leads to the dinning room and Royal Family's private apartments via a long marble staircase. 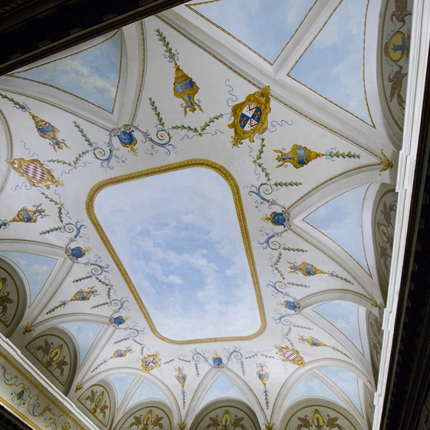 Visits of the Prince's Palace/State Apartments are opened until October 15th 2019. April 2nd - June 30th / September 1st - October 15th : 10:00 am to 5:30 pm (Palace closed at 6:00 pm). The visits wil be closed during the Formula 1 Grand Prix week-end (May 25th and 26th). The only vehicles that may drive into the Old Town (Monaco-Ville) area are those having Monaco license plates or French license plates with the last two digits 06 from the Alpes Maritimes Department. All other vehicles are strictly forbidden to drive to Monaco-Ville. Parking : Busses and cars are advised to park in the Parking des Pecheurs. One may take either Monaco Bus line 1 or 2, which ends at the Place de la Visitation bus stop and signed Terminus Monaco-Ville. The bus stop is next to the Museum Chapelle de la Visitation. From the Place de la Visitation bus stop one follows the posted signs through the small streets to the Palace, a short 5-minute walk. One may take the 10-minute walk from Place d'Armes up the Rampe Major that brings you right to the Palace Square.